Duck Covers provide breakthrough protection that keeps Patio Chimineas looking like new. Our innovative multi-layered material creates superior airflow between your cover and chiminea, eliminating condensation that causes mildew. Duck Covers do not crack or fade over time. Migrate to the best in patio furniture covers. Hickory Stand-Up Patio Heater Cover The Hickory Stand-Up Patio Heater Cover from Classic Accessories is made from durable Weather10 material featuring a rugged fabric outer layer with a laminated waterproof and wipe-clean inside coating. The Weather Leather trim looks authentic but wont rot. Fits heaters up to 95 H x 34 Dia at dome x 18.5 Dia at base. Hickory Stand-Up Patio Heater Cover is rated 4.9 out of 5 by 14. Rated 5 out of 5 by Sapphire from I'm very pleased with my products. I'm very pleased with my products. Rated 5 out of 5 by Billibouy from outdoor heater Fits the tower perfectly. Color is a match to the previously purchased firepit cover. Rated 5 out of 5 by Alfred from The out door heater cover has met my goals and... The out door heater cover has met my goals and desire. Rated 4 out of 5 by Jerry from I like the cover very much. Only complaint is there... I like the cover very much. Only complaint is there is not a drawstring to close the bottom. I did purchase to addl. ones. Rated 5 out of 5 by Princess Passing Through from Classic Addition to Our Patio This is the first product I have owned by Classic Accessories and I am 100% HAPPY, AMAZED, and SATISFIED. 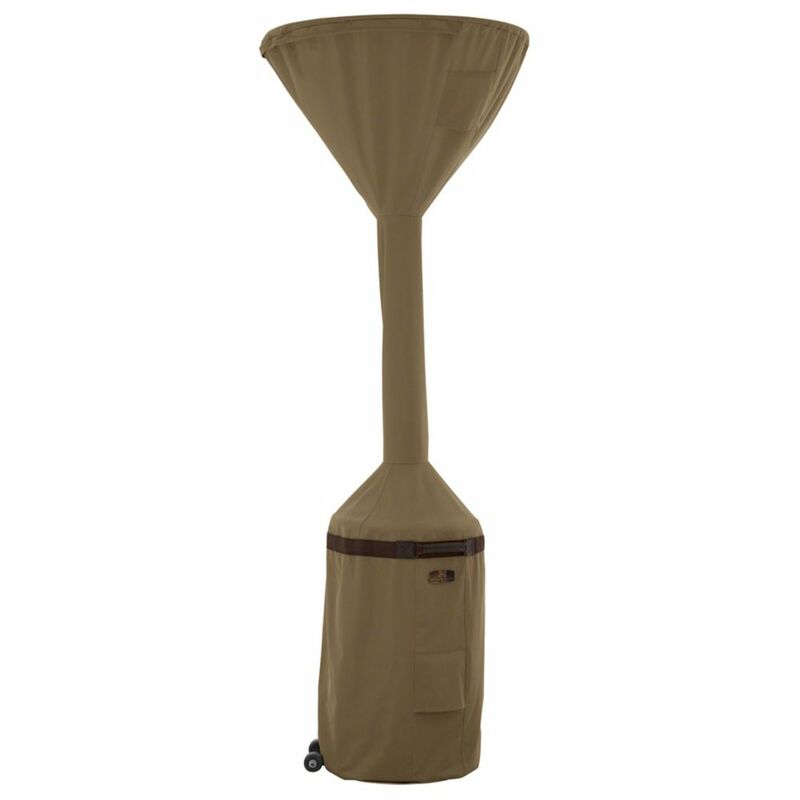 I purchased the Classic Accessories Hickory Heavy Duty Pyramid Torch Patio Heater Cover - Durable and Water Resistant Patio Cover (55-336-012401-EC), Hickory colored and I am totally THRILLED that I found, on the first purchase, a superior quality product for our new Dyna-Glow outdoor patio heater. This product is made with such a great quality material, it is of a nice substantial weight, nothing cheaply made on this one, and is extremely attractive. It has padded handles in a brown leather material and comes with a Limited Lifetime Warranty (I just resisted mine on line) and is weathered protective and water resistant. I plan on purchasing other matching items for our outdoor living area furniture (patio table, lounge chairs, etc). I love the summer but can’t wait until the first few nights (or mornings) of a cool crisp breeze to use the heater. Now, thanks to Classic Accessories I have a handsomely tailored made look cover to keep my outdoor Oasis with sleek and sophisticated. Rated 5 out of 5 by 1 Gene from Great features I purchased this several months ago and very fine product and heavy material. It does exactly what the information says about it. I live in Ill. and the wind gets pretty strong and does not bother it at all.